Here at Nest Campers we hear amazing feedback from returning Nest campers about how well-kept and green Slovenia is. This country is one of the greenest destinations in Europe and we know you’ll agree it deserves to remain that way. Use official campsites and camper stops whenever possible to reduce damage to natural areas/habitats. Don’t blaze your own trail to get to that perfect spot. Recycle and compost as you travel. Cans and bottles can always be recycled. Minimize the use of disposable cups, dishes, and utensils. These purchases can seem convenient at the time, but they add up to create an overwhelming abundance of trash. 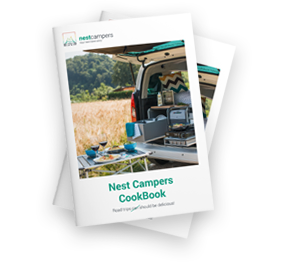 And you do have all the kitchen utensils in your Nest campervan. Seek out and follow all fire rules and regulations. Use the natural environment to your advantage. In hot environments, seek out natural shade instead of the vehicle A/C. In colder climates, park in the sun. Please use public toilets and facilities. When these are not available, deposit solid human waste in catholes dug 15 to 20 centimeters deep, at least 60 meters from water, camp, and trails. Cover and disguise the cathole when finished. Pack out toilet paper and hygiene products. When purchasing bottled water, select huge bottles and avoid the single use versions. Be respectful of your surroundings. Clean up after each stop, be aware of how you dispose of your waste. Take that extra step to leave each place better than you found it. ​Take only pictures, leave only footprints.